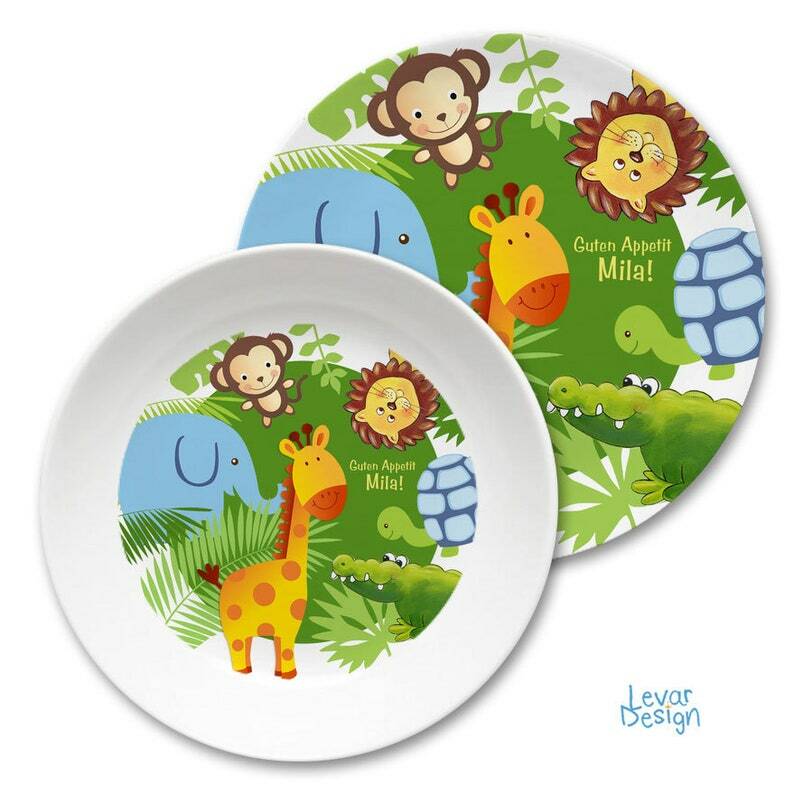 Magical, 2-piece personalized children's tableware made of melamine for small and large children in Germany. Each product is specially made for you and is therefore an absolute unique piece. Consisting of a deep plate and a small flat plate. 1) 190 mm deep Melamine plate/shell (the name of the child can only be printed within the subject). Available in green, blue, pink or yellow. All melamine products carry the seal of approval of the accredited Testing Institute Wessling. In this way, it is ensured that the articles comply with the legal requirements for food contact items in accordance with the regulations (EU) 10/2011 and (EU) 1935/2004 and that, if they are used, they do not endanger the health of users Is. Can leave cut marks and damage the surface. The melamine products are not printed, but their personaliserten motifs are inserted into the article (plate and bowl) by means of printed press-in foils and then sealed with a melamine gloss layer. Their individual design is thus protected against mechanical damage and abrasion by the dishwasher. In the case of articles with increasing margins, production may result in a slight wrinkle formation through the Insert films. Note: Melamine items are not suitable for use in the microwave oven! Please take into account during your planning that the production/dispatch of personalized melamine children's tableware takes about 6-10 working days due to the personalization.